Much like Amit Singh and his Hanoimania, I regularly attempt to port my friend’s game Caster to as many platforms as I can. Because of some good language and API choices upfront (C++, OpenGL 1.X, SDL, etc…) the Caster codebase is very portable. That portability combined with its relatively humble (for these days) performance needs has lent the (currently still unified) codebase to easy porting. 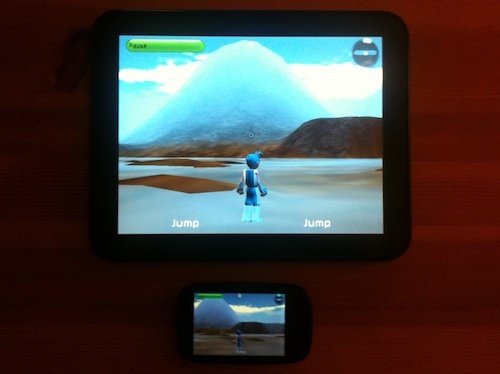 This multi-platform journey began many years ago before Caster was even released. Caster was still in early development when Mike approached me with the idea of maintaining a concurrent Mac build. At that time Macs had not yet moved over to x86 processors and so the most difficult part of the process was reverse engineering Valve’s Half-Life model format (which Caster uses for animated character models). The Half-Life model format was a binary, in-memory format utilizing offsets which meant that while loading it was quick and simple (just read it into memory, no processing whatsoever) it was unfortunately dependent on little-endian byte order to work. Other than that and a couple of other issues, the Mac port was really straightforward. So before release, Caster was solidly supported on both the Windows and Mac platforms. After release another guy helped out with the Linux port of Caster and so at that point we now had the major desktop operating systems covered. Over the years we added slightly different versions for the desktop platforms to adapt them to specific distribution avenues like Steam and the Mac App Store. The first port that required major reworking was iOS. That adventure was chronicled in my post Caster for iPhone: A Postmortem. Mike and I had the opportunity to give a presentation about what we learned at GDC Austin ’09. Later on as the Android and webOS mobile platforms took shape, I started to look into porting Caster to those platforms as well. About a year ago I was able to get a hold of a Palm Pre from a friend and so I started poking around the webOS PDK (Plug-In Development Kit). Unlike iOS, the primary development environment for webOS is (duh) web-based and not suitable for high performance games. However, through the webOS PDK you can write C-based programs that utilize OpenGL and other libraries much more suitable to game development. I was able to leverage a lot of the work from the iOS and Linux ports and within a day or two I was able to get a working version of Caster up and running using the PDK. Hardware-wise the Pre is somewhat similar to the iPhone 3GS in that it has an A8 CPU and PowerVR SGX530 (as opposed to the SGX535 in the 3GS). This fact made it easy to just reuse all of the carefully optimized assets we had worked on for the iOS port. There were some things like the PDK touch APIs that needed a bit of reworking but it was pretty straightforward. I considered the port to be 98% complete but there were 4 show stoppers and general performance issues that prevented me from releasing it to the webOS App Catalog at that time. I had suspicions that my issues might be resolved in a future version of the OS and so at that point I decided to wait for the next webOS update and then re-visit the port. Unfortunately I was already running the final version of webOS released for the Pre (1.4.5) and so I put the unfinished port on the shelf and went on to other things. Fast forward to a week ago. I was able to procure some newer hardware (a Pre2 and a TouchPad) that would allow me to test the Caster codebase on webOS 2.X and 3.X. I had hopes that the newer versions of webOS would resolve some of my show stoppers. Fortunately they did and I was finally able to finish up the port that I had started a year ago. Caster now runs really smoothly on the Pre2 thanks to the updated OS and a CPU clocked significantly higher than the original Pre. Caster also will run on the HP TouchPad in a manner similar to how it runs on the iPad. Performance on the TouchPad is somewhere in-between the iPad 1 and the iPad 2. Getting the year old port to work on the Pre2 was a piece of cake seeing as the hardware was very similar to the original Pre. The TouchPad had some interesting differences (outlined by Palm here) which actually made it more like developing for a desktop platform than a mobile one. This entry was posted on Thursday, October 6th, 2011 at 9:25 pm	and is filed under Bugs, Caster, Computer Games, Debugging, Games, Graphics, Hacking, Indie, iOS, OpenGL, Performance, Programming, Video Games, webOS. You can follow any responses to this entry through the RSS 2.0 feed. You can skip to the end and leave a response. So Dreamcast port is officially under development ? Well, any hopes of expansion for caster on Webos? What is the hold up on Android? I’m not trying to bash on WebOS, but it doesn’t seem to have a very good future. 2. No STL implementation. Found a portable version and hacked it together but not everything was working. 3. No touch event access. To get touch events I had to pass them across this super unreliable/high latency Java->C barrier. 4. No functioning gdb. They said that gdb support was in place but after pounding on it for 3 days it still didn’t work. 5. Super unreliable Eclipse integration. Half the time stuff just didn’t work. Made development no fun. Wow! This game looks amazing! If you port this to the Dreamcast I will give you free advertisement! Please make this happen! We are lacking 3D games in the Dreamcast indie library as of late. Nobody makes the anymore. Sure, we get Shmups every year, but something like this is just what the Dreamcast needs! PLEASE!!!! Do a Dreamcast port, would be incredible. Game looks great! Keep it up!!! Please release this game for the Dreamcast on physical media. If it’s a fun game, I’ll buy it. I love supporting high quality homebrew games for retro platforms. Thank you. Physical Dreamcast release? I’m there! Please port this to the Dreamcast we need another new fresh game. The screen shot look pretty sweet!! Looks amazing, and would look way better playing it on my Dreamcast! Wow! What a great outpouring of support for one of my favorite platforms 🙂 You have inspired me to dust off the old port and re-asses where it stands. So I spent all day yesterday revitalizing the port and trying to see what it would take to make progress on it. I am still able to get it to compile and link (with a lot of pain) and I can still get the codebase to execute within lxdream (an emulator). Last time I got as far as being able to get a colored quad onscreen. This time I was actually able to get a little farther and was actually able to get a textured quad to display! Unfortunately I wasn’t making progress very quickly. KallistaOS and the toolchain while awesome, are behaving quite erratically (especially OpenGL and the filesystem), at least inside the emulator. I am not sure to what degree things would be different on actual Dreamcast hardware but I don’t have a Broadband Adapter to load code with. I would love to be able to debug things better and develop on actual hardware. Hey thanks for the quick reply! I played your PC demo last night and got lost in it for hours! It really is an absolutely amazing game. I say its a lot like Mega Man, Sonic and Crackdown games all rolled into 1 but still something completely unique and original. KallistiOS isn’t as powerful as we had hoped for 3D games. There is a new developing environment in the works called CubicVR 3D engine. It appears to be pretty amazing for 3D games too. Here is the Dreamcast thread. The developer said that he will start working on the Dreamcast port now that he received his Dreamcast SD adapters in the mail. Here is also a video of the engine running. If you wanted, you could use the Windows CE SDK, but you might not be able to sell your game then as Microsoft don’t license out the SDK any more. Sorry forgot about the videos. Here is one from 2 years ago, and it is pretty basic but you get an idea of the graphics. This is a PC demo of the engine, and the shaders are a little higher than DC can handle but they want to get this vehicle demo ported over too. Using official SDK will be illegal… You dont need Broadband Adapter i’d suggest you to use dc sd adapter instead or coders cabel. Are mods supported on the touchpad version? A Dreamcast port of this game would be absolutely amazing – I would definitely buy it! As for using the DC SD Adapter for debugging, wouldn’t the low transfer rate of the serial port be a problem? @Adam Yea, if I were to debug on actual hardware I would want the speed of the Broadband Adapter. serial port speed that sd adapter uses is enough to run many big commercial games like this http://www.youtube.com/watch?v=7XRp6KR2_cg so i think it is good for development. A Dreamcast port will be a welcome addition. There are many Dreamcast loyalist out there probably more than some people realize. Any new game especially a game that isnt a shooter will be great. Not that most of have problems with shooters, just it would be different. I dont know much about the SD Adapter thingy myself, however if the game comes in this form something new for me to learn lol. Thanks and keep up the great work DC4EVER. Wow, Caster looks awesome. Count me in as a buyer of a Dreamcast Port. Keep up the great work! Thousands of Dreamcast Fans are eager to play something different than a shooter. Personally I’m very much looking forward to playing STURMWIND, but I guess many of the community are indeed hungry for something else. I think physical releases of Hypertension AND Caster would sell big time. I would definitely buy both. Snielsen, do you think a Dreamcast port of Caster would look as stunning as the PC Version? The lighting effects are great. Would this quality remain? Do you expect any hardware limitation related problems? Omnibot i dont foresee hypertension coming out anytime soon. They decided to rebuild the game up again so im expecting we wont see this title yet again for at least a minimum of a year. I echo your other sentiments though im looking forward to Sturmwind myself. However, something other than a vertical/side scroller space shooter would be an almost instant hit on the DC. I know we have Gunlord but that game has essentially Super Nes graphics on it. Even still it generated a lot of buzz in the DC scene. I hope Hypertension will release at all. I like their idea to replace the former 2d objects and enemies with low poly 3d models. That decision made Hypertension interesting for me. I don’t need a FPS with Doom like graphics on the DC. @Omnibot2000 Speculating as to the image quality of a potential Dreamcast port, I would suspect that it would be fairly similar to the iOS/webOS version. The codebase was originally written targeting OpenGL 1.1 and does all the effects in fixed function. There are some effects that are in the PC version that are not in the iOS/webOS version like true reflection, the view warping weapon effects and (optional, hidden setting) cell shading. I don’t think the iOS/webOS experience suffers very much to not have them though. Caster is not extremely demanding so I would expect both performance and image quality to be pretty good. My biggest issue is the quality and stability of the known OpenGL implementations for the Dreamcast (kos gl, kos-ports glx, any others?). Are there any significant Dreamcast OpenGL homebrew projects out there? Any pointers in that regard? Is this helpful at all? It is nice to hear that you ordered a SD card adapter. I’m sure at least this will be useful. Sorry for my unqualified comment. I hope there will be a nice Dreamcast port (reflections would be great but I wouldn’t miss cell shading) and it will be a big success. Well, I think there is something else that was just ported over called bennugddreamcast, I believe its a Fenix environment and will have 3D support too. If this pans out I think I’ve found your answer. 😉 It has only just been ported for about a month or so, and they have a little more to impliment but the 2D stuff is pretty nice looking so far. Here are some pictures of the 3D OpenGL renderer. Not on Dreamcast hardware but you get an idea of it. Omg dumb me again, accidentally pressed submit and wasn’t finished typing. This has support for the OpenGL 3D renderer (currently in beta) based on the Irrlicht Engine that also provides an advanced physics engine. Also the guy porting it said when the environment is fully ported over 100%, he will try and get the Yeti 3D engine working on Dreamcast. It looks like 32bit gfx though. RELEASE THIS GAME FOR THE DREAMCAST!!! I WILL BUY 100 copies! I think a Dreamcast port would be really nice. Id buy that. Aright, so the SD Adapter FINALLY arrived and I have done some initial poking around but haven’t really dug into it yet. It took me a long time to realize that DreamShell doesn’t have the ability to run naked .bin files and I need to package things up into a sdiso file to get things to work. I was able to get some homebrew to run and that was pretty encouraging. It sure beats fumbling around with burning discs that’s for sure. I will try to find some time over the holidays to package my Caster .bin up into an sdiso and see if I can get it to execute on the hardware. I will follow the progress of this until it’s release on the Dreamcast! I would love to see a DreamCast port of this game! I’ll put my $ up for a CD release of this right now. I would REALLY like a Dreamcast port of this game! It looks amazing! It´s gonna be really great to see on Dreamcast!! @Reich werden It is not officially in development, but I do plan on putting work into bringing up the codebase so that it’s functional on Dreamcast hardware when I get some free time. So far the results have been mixed as to whether it will become a reality, but every time I take a crack at it I do get a little farther. Last time I worked on it I was able to get a simple, textured quad on screen using stock Dreamcast hardware and the SD adapter. Sneilsen you rock and you are my hero if you get this on Dreamcast. Either way you rock though….!!! Are you working on a Dreamcast-Port? @Hergen I have had to put the port on the side as of late to concentrate on other projects but I hope to find the time to pick it up again sometime.